Died from injuries sustained three days earlier from an accidental gunshot wound to the chest at Camp Taji, Iraq. Amy, the daughter of an Army Chaplain, graduated high school and became intrigued with traveling to the Northeast United States. After moving to Maryland and instead of going to college, Amy decided she wanted to join the Army. She knew what she wanted to do with her life. Amy flew out to the Middle East in early December and was deployed to Iraq on Christmas Day, 2005. On March 1, 2006 she was promoted to Private First Class. On March 8, she was shot in the chest. The Duerksen family found out about Amy’s injury quickly thanks to a fellow clergyman, who also called with updates during surgery to remove her right lung. However, Amy’s condition worsened before she could be airlifted to Germany and she died during surgery. “Amy died doing what she wanted to do and fulfilling what she believed in,” the family wrote. “She was serving her country and defending the freedom of others. This noble and honorable American tradition can never be diminished”. 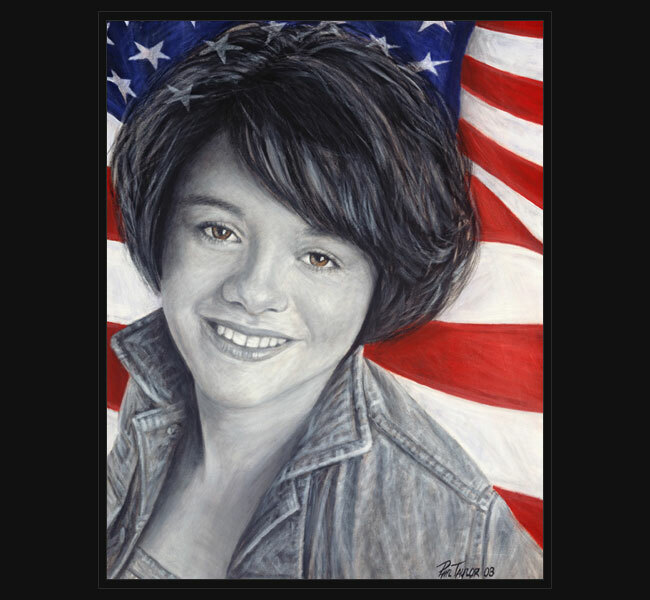 Original portrait was presented on May 16, 2008 to her parents during a special event held in Amarillo, Texas.